Preview Book Review: Barsk, The Elephants’ Graveyard. Space animals kidnap elephants to learn how to speak to the dead. Anthropomorphism on a whole new level! 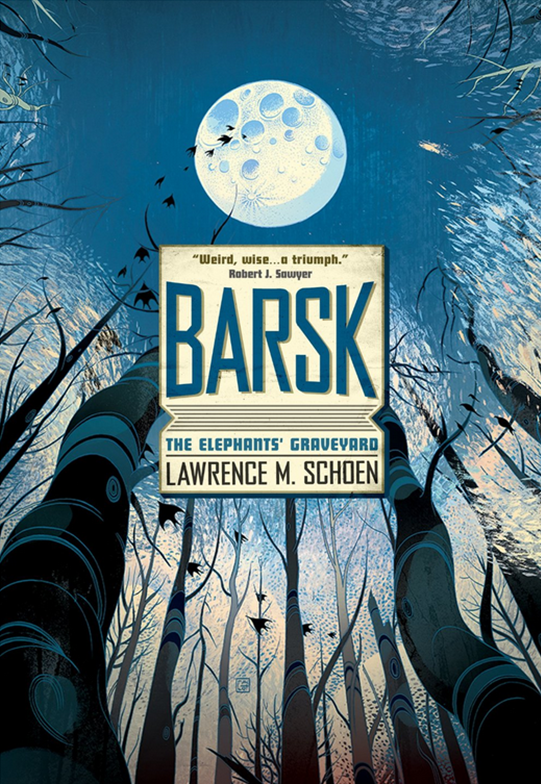 Just finished reading the preview excerpt of Barsk: The Elephants’ Graveyard by Lawrence M. Schoen (preview gleaned from netgalley). Enter Barsk, a planet of well-wooded archipelagos under the care of spiritually-attuned, introspective, and endearing elephant beings called Fants. A select few Fants, called Speakers, have the ability to summon dissipated particles of energy from the universe to assemble memories of their dead loved ones to pester…ahem that is, converse with them. In fact, the whole process of dying is literally a boat journey to an unknown destination (whose location is only mystically revealed when one is close to death). Far from being an end to be feared, death is embraced as the last adventure of life, and something every Fant has come to terms with long before his time comes. I am so on board with wise elephant beings gathering subatomic particles of memory to talk to their dead!! Such a weird, neat idea. Aside from the occasional whipped-to-death war elephants that appear in the likes of LOTR, elephants just don’t get enough time to shine in fantasy/sci-fi. 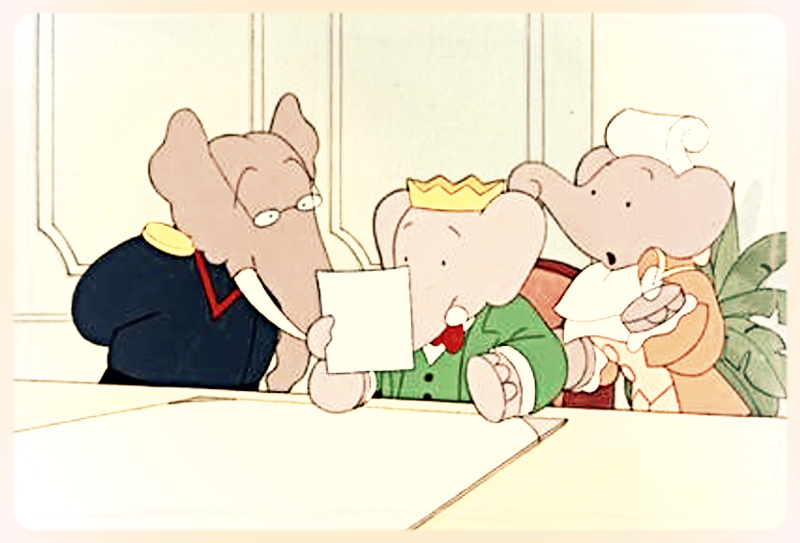 Cornelius, Babar, and Pompadour, hard at work running Le pays des Éléphants as usual. From the twelve chapters of the preview, you get a glimpse into some gorgeous world-building. Especially Barsk and the tree cities in which the Fant dwell. I just want to ride along in the little Fant, Pizlo’s, travel pouch as he slides down the foliage-ridden “Chimney Shafts” that connect the upper, more civilized parts of the arboreal city, to the Shadow Dwell—the dim, half-forgotten parts of civilization at the foot of the giant trees. The Shadow Dwell, in particular, is made up of massive roots, hidden pools, and old memories—it feels cozy yet surrounded by something sublime and sacred. My brain repository immediately dug up the feeling of snuggling into the mossy nooks of the tree hollows in Totoro. Definitely jealous of Pizlo’s hidden-away haven for daydreamers. The cozy tree hollow where Totoro likes to nap. Interesting thing to note, the author himself, explained on his blog that the beautiful cover of The Elephants’ Graveyard was created by artist Vito Ngai, who was inspired by these very chimney shafts. Definitely my favorite scene in the preview chapters. Reading a story involving talking animals makes me so nostalgic for the likes of Redwall, and Chronicles of Narnia. I haven’t read anything since then (that I can remember) involving anthropomorphic characters. The Elephants’ Graveyard features not only elephant beings, but otter, bear, dog, cheetah, etc…the animal kingdom has colonized the galaxy! Each species has its own unique culture and mannerisms based off of their particular physiques and lifestyles, which are gently revealed to the reader. And if you’re one to gripe about sci-fi/fantasy writers who take the lazy way out with “homogeneous races”, rest assured that in The Elephants’ Graveyard, each species of animal has it’s own nuances and internal complexities of going about living. Even the rather benign Fants will turn their trunks up at smellier, under-dressed street urchins like Pizlo. Oh, and did I mention there are even anteater and sloth beings in here? Matter of fact, one of our protagonists, a Fant named Jorl, had once been a soldier under the command of a sloth space-captain. Dude. Working under sloth time is totally what I wish I had right now. Except… now I feel bad for stereotyping sloths. Speaking of discrimination in this animal-ridden galaxy, the Fants have it bad. A group of ne’er-do-wells have taken it upon themselves to harass the Fants in the hopes of stealing secret cultural knowledge about koph, a drug that allows its users to speak to the dead. I do hope their fate improves as the story progresses. Barsk: The Elephants’ Graveyard will be released in its full glory this coming Dec. 29th, and I am going to keep my eye out for it. With elements of Dune-esque mysticality (and obsession over a mind-opening drug), surprising and expertly executed ideas that weave together realms of sci-fi and fantasy, and a cast of sympathetic characters, this is definitely a book for me! [Jorl] filled the resulting darkness with images from his own memory, imagining a familiar room in a house on the island of Keslo. The dimensions and materials, the colors and textures and scents formed around him. That easily, he sat in a small alcove that lay just off of the kitchen of the home maintained by his friend’s widow. The walls were beech, yellow, bright in their own right and polished to a high sheen. A hand-braided rug covered the floor from the kitchen’s threshold to the hidden door in the back wall that provided a less obvious entrance to the house. A tapestry woven of wild flowers hung on that wall, filling the air with light, sweet fragrance. Two comfortably curved benches faced one another, set far back against opposite sides such that their occupants would be unseen by anyone passing the opening. Jorl saw it all in his mind, just as he had seen it before taking the koph and settling into that very spot after dinner. When he had sufficient number, he willed the particles to coalesce into his friend’s form, occupying the bench opposite him, visible to anyone who possessed the Speaker’s gift. “Your wife made the most amazing dinner tonight,” said Jorl, the mental construct of himself smacking his lips with satisfaction while in the real world his head pressed back against the wall, his trunk draping languidly down his chest, a trickle of drool starting at the corner of his flaccid mouth. Next Fairytale flights of fancy. Art by Erin Kelso. I really want to read this! I’ve had it on my list for a while now. I didn’t really want to read the excerpt, though, I think they just frustrate me knowing that I can’t read the entire book right away. But I’m glad you loved it, I hope you get the chance to read the whole book!